Are you the kind of art lover who brings home handcrafted souvenirs from all of your travels? On the "malecon" (boardwalk) of Puerto Vallarta, you'll find a wide variety of stands by artisans and local painters selling original pieces at prices to suit any budget. 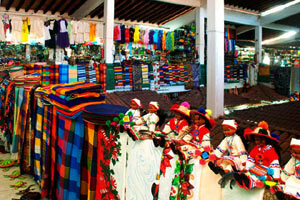 The Rio Cuale City Market offers crafts ranging from home decor to traditional clothing and jewelry, along with art from the Huichol culture. At the Paradise Community Center, you'll find art from all over Mexico and the world, not to mention the numerous specialty shops in the Puerto Vallarta Hotel Zone. Many excellent artists display their work independently along the Puerto Vallarta boardwalk and in other public venues, allowing you to view endless talent and quality before bringing home a 100% original piece of art. Why not add on to your private art collection or get started on your own while enjoying a vacation at one of the many amazing hotels in Puerto Vallarta? Plan a city shopping tour to discover that perfect piece to adorn your living room, bedroom or office, or purchase beautiful local crafts for friends and family. In Puerto Vallarta, you'll find extensive artwork that's worth the journey. Experience amazing sunsets, beautiful beaches and fun Puerto Vallarta nightlife, and take home an artistic souvenir to remind you of your stay in this picturesque destination.